About a year ago, I wrote a post comparing cloud computing providers to fast-food chains. I called Amazon(s amzn) Web Services the McDonald’s of the cloud, Rackspace(s rax)the Wendy’s and Google(s goog) — in a close third place — the Burger King. Since then, Google has been steadily creeping up on Rackspace and, on Tuesday, it blew the doors off with massive price cuts, progressive pricing models, and new features that firmly established Google as a visionary and AWS’s primary competition. Google’s newfound cloud prowess was the major theme of our Structure Show podcast this week. Barb Darrow and I discussed reactions to the news and what it means for other top-tier cloud providers such as IBM(s ibm) Softlayer, Microsoft(s msft) and Rackspace. 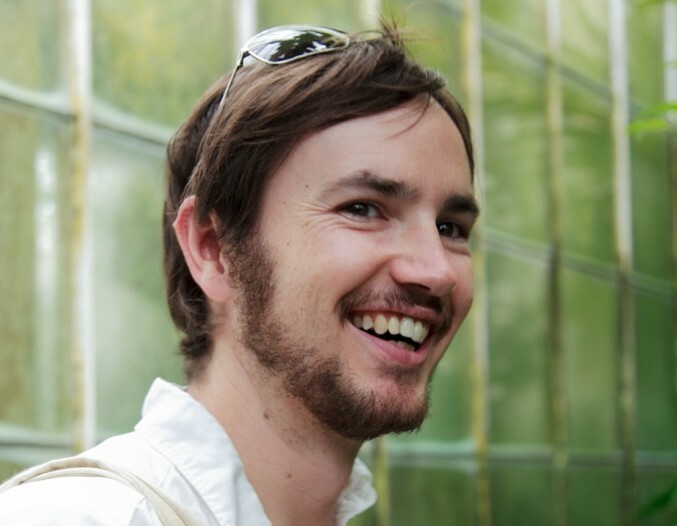 Our guest, Ben Whaley of Anki (it makes an artificial intelligence-based toy racing system), said that although his startup is a happy AWS shop, Google looks a lot better now than it did a week ago. If you listen to the whole thing (embedded below), you’ll probably get the sense the cloud market, at least in terms of who’ll have the most users, is really a two-horse race. It seems safe to assume Microsoft will find a niche (probably a big one) and be successful with the newly Windowless Azure. IBM Softlayer is doing some interesting things, especially around Watson as a service, and should be a strong revenue source for Big Blue. Rackspace, well, it’s in a tough spot. Between “enterprise” clouds squeezing it on one end, and the more-innovative, always-price-slashing AWS and Google (AWS matched Google this week with cuts of its own) on the other end, it’s hard to see how it can continue with its current strategy. In this case, being in the middle is less a case of providing the best of both worlds, and more a case of being trapped in a nether region with no easy escape to either world. However, the one thing we didn’t discuss in any great detail is what Google’s ascendence means for the smaller cloud providers out there — the Joyents and GoGrids, and the hot new startups such as Digital Ocean. These classes of providers are often specialists in one thing or another, and usually pretty innovative. Right now, they might even be less expensive than Google and AWS. But the price and feature wars between those two giant companies are going to make life a lot harder for the small guys. One could compare it to the client-server era, where large server makers dominated in terms of market share and revenue, but there’s a big, big difference in the cloud era. 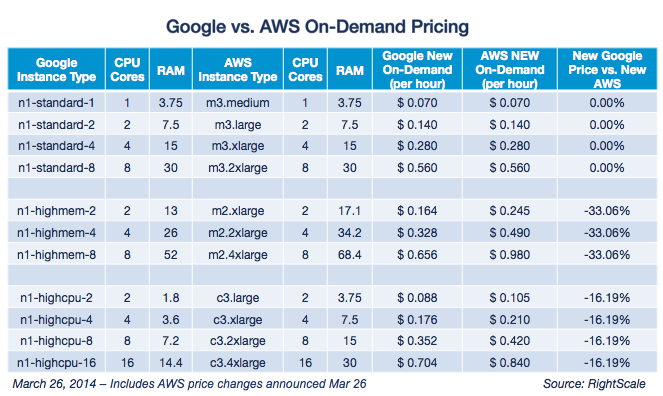 Rather than use their dominance to extract more money from users, Google and AWS are constantly cutting prices thanks to economies of scale and their efforts to minimize the cost of running their massive data centers. When they launch new features and services — which they do regularly — they’re either free or complementary, but never rolled into the price of the core services. Cloud computing users must be pleased as punch to see all this competition at the high end — forcing AWS, Google, Microsoft, and IBM to race to the bottom on pricing and to the top on features — but other cloud providers must be sweating bullets. Maybe they have immutable advantages I’m ignoring, but nothing seems too defensible given the big guys’ deep pockets, top-tier technologists and willingness to accept low(ish) margins. What’s an advantage today is table stakes tomorrow, which means there’s really no time to rest. The key to cloud growth for smaller players is to move as high up the application stack as possible. They must solve a specific challenge and provide the highest level of service. For example, setting up Big Data technologies is a really hard challenge for most enterprises and developers. They need help. But the service levels of Google or AWS are what youâ€™d expect at a fast-food restaurant. Sure, you want to save money and eat at McDonaldâ€™s and Burger King. But there are other times when all you want is a good steak. Full disclosure: I work with GoGrid, which provides purpose-built cloud infrastructure for Big Data deployments. I feel a little back for Rackspace. If I was doing any hosting of web apps or hosting, I would definitely choose RackSpace as they seemed to cater to individuals and business as well. And they had good packaged up services like WordPress hosting and the like. I would hate for RackSpace to become a victim in the AWS and Google price war. Hopefully all will survive this period and come out stronger on the other side. I don’t know any software programs that integrate with Google or Amazon, but I know plenty that integrate with Dropbox. Of all the major players, Amazon is the only one built from the ground up to win in low margin markets. It will be very interesting to see how this battle plays out, but my 2 cents is Jeff Bezos will emerge the victor. Isn’t this pretty much the same argument that people used against the idea of making a new search engine in 1998? The wonderful thing about the internet is something truly better can beat out bigger. Arguably, although Google won in search largely via software and a smarter revenue model. Doesn’t seem that will be enough in this case. The trick would be bringing together scale (e.g., via a marketplace of small providers or a brokerage) with enough features to compete as a platform. The difference is scale. WHen the web was newish in 1998, you could have a $1m startup with the capacity to handle the world. Now, it would take hundreds of billions to rival Google in the same space. The only real avenue of approach is to do something fundamentally different, not just better. There is still lots of interesting stuff, and ultimately the Googles, Facebooks, and Apples of the world WILL collapse under their own weight and new things will emerge, but nobody is going to come along and “out-google” google. The company I used work for did a mile of research on this just several months ago. What they concluded was that in looking at just the b/w+storage+cpu costs of any workload would only be addressing less than 35% of the total TCO, and so the data strongly suggested that Microsoft and IBM would in the end be less expensive for those situations in which all of the services ( i.e. software, support, DR, maint of sw etc ) because those companies have more robust service portfolios, while Google/Amazon would be less for those workloads in which just infrastructure is needed. An even larger delta was seen for workload in which regulatory, compliance and auditing requirements existed (which favored MS and IBM ) because of their rich skill bases and other professional services add-on packages/services, so it might be that workloads not needing ‘mature’ services sit on Amazon/Google, while Tier-1+2 would flow to IBM and MS. I think this matches market data in which start ups+ and Tier-3/4 apps live on Google/Amazon, while larger bricks and mortar companies tend to live on IBM and MS. Sorry. Typo in my previous comment. BTW: I don’t think we need to remove m2. * instances from comparison. AWS will not adjust the prices for previous generation of instances. You should compare only m3. * here. m3. * is replacement for m2.*. So it is a little bit misleading to have here m2.*. Non-skilled AWS users will get this comparison incorrectly. The RSS feed is showing “no media file” for this episode. Also, where is the ability do directly download this episode? But the overall point of your article is very accurate. No one else has the low cost basis and the scale that AWS and Google do. Also others can’t live off slim margins. Hence over the long haul it will likely be a two horse race between AWS and Google. AWS is however estimated to be already a over $4B/year business, while GCE is < $50M/year. And AWS has tons more enterprise customers, and many more services. So it will likely be AWS that will dominate for a while. vCHS, Rackspace etc are going to find it very hard to match these prices (and knowing AWS and Google, you can bet that this is not the last price cut). Microsoft might match prices for a while, but I can't see it being able to match prices over the long term, as its cost basis is much higher. Cisco's and Oracle's clouds are dead before even starting. And yes the small players like Digital Ocean that do not have the scale, breadth of services or low cost basis will have an uphill fight for survival. Great for the consumer, but a tough market to be in if you are a cloud vendor and not AWS or GCP. Is this not a lot like China dumping solar panels. It is an engineering race to stay as close to Moore’s Law in time and as low in margin as possible. Garage scale tinkerers can sell their ideas as Apps. Amazon is a solid choice for start-ups, but that represents a very small part of the overall market, especially when you include Enterprise and hybrid data centers. That article you referenced is a complete farse. Azure has “more internet facing Windows servers”, according to netcraft. AWS dwarfs them in every other category. I even doubt the data integrity of that report, bit that is another discussion. AWS Re:Invent 2013 clearly demonstrated that the enterprise has embraced AWS as much as the startup community has. Hybrid datacenters create major overhead, and will only be sustained by companies that feel restricted by policy. Those same organizations are starting to tip over and use public cloud today. The fact is that AWS runs highly certified facilities that no enterprise can compete with. There are few companies as experienced or efficient at operating infrastructure at scale as Google, Amazon, or Microsoft.